Liver recipient Bruce Giles has been honoured at a 2018 Australia Day service for an outstanding year of sporting achievement and service to the community. Bruce won gold for Australia at the 2017 World Transplant Games in Malaga, Spain, where he also mentored the younger members of the team. With over 40 years of cycling experience under his belt, Bruce was an asset to the Aussie team, who came 6th overall in the medal tally, advising and encouraging teammates, and picking them up after a defeat. 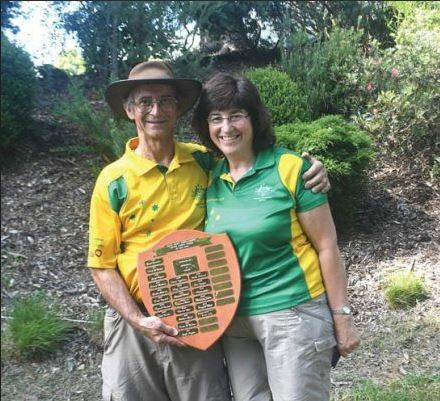 Named ‘Senior Sportsman of the Year’ at the Tumut ceremony, Bruce, pictured with his supportive wife Robyn, is also a tireless campaigner for organ and tissue donation awareness. A gentleman and superb athlete, Bruce regularly shares his story with the media to inspire the next wave of life-saving donors to join the register. On behalf of the entire Transplant Australia community, we would like to congratulate Bruce on this magnificent achievement. Well deserved – thank you for all that you do. For more information on organ and tissue donation, visit donatelife.gov.au. Amazing stuff! You impressed me! What I wanted to add is to congratulate Bruce on this magnificent achievement. Well deserved!